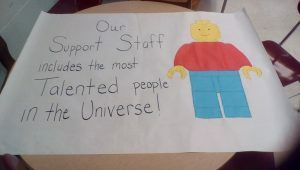 Trousdale Elementary School – Our support staff each received a handmade Lego picture frame, Lego lollipop, and Lego themed cupcake. Trousdale Country Elementary School. Click here for the photos. Trousdale High School – We had a great time celebrating our Support Staff! We have the best Attendance Clerk, Classroom Aides, Guidance Assistant, SRO, Tech, and Nurse around! We really do appreciate them! Click here for the photos.